We are a leading Manufacturer of trendy chinese collar shirt, white chinese collar shirt, chinese collar yellow shirt, light blue collar shirt, chinese collar shirt and plain chinese collar shirt from Chennai, India. 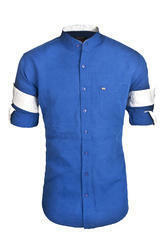 Supported by a group of competent employees, our firm is involved in providing Trendy Chinese Collar Shirt. 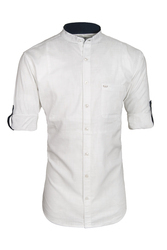 We are one of the leading manufacturer and suppliers of White Chinese Collar Shirt. We obligated to meet the quality standards of clients requirements. We are one of the leading manufacturer and suppliers of Chinese Collar Shirt.We obligated to meet the quality standards of clients requirements. To ensure timeless appeal,Urban design keeps shirt designs elegant and simple. 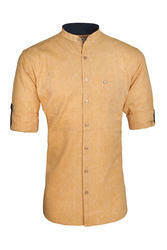 Casual shirting has become de rigueur with this quintessential piece featuring a mandarin collar and curved hems. Made From 100% Luxurious Cotton. We are one of the leading manufacturer and suppliers of Plain Chinese Collar Shirt.We obligated to meet the quality standards of clients requirements.